I saw this new article and I thought you would all enjoy the photo. You’ve got to wonder how this happened: “You’ve got a lot of confidence for a dog your size. I like that,” a golden retriever said flirtatiously to a dachshund. “Well, today’s your lucky day, because I’ve got a thing for tall blondes,” the dachshund replied with a roguish wink. 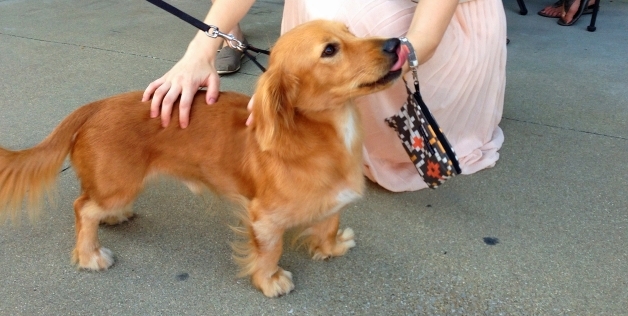 After a few dates in the park, a coy game of tug and war, the love of a lifetime blossomed between the fetching couple, and along came this guy, a gorgeous golden retriever-dachshund mix. You don’t see this kind of dog very often, but we sort of want one. He makes us believe all those romantic comedies about how opposites attract.